It was reported this week that on Thursday, in a speech before the Economic Club of New York, 91-year old former Chairman of the Federal Reserve (hereafter the ‘Fed’) Alan Greenspan stated that the Dodd-Frank Act 2010 was the ‘worst legislation since Nixon’s wage and price controls of the 1960s’, and that we ‘could do away with all financial regulation – almost all of it – if we did one thing, and that is raise the capital requirements of banks’. The debates about the merits of such a statement will only be touched upon in this post because, as with everything of this nature, the analysis could stretch to volumes. 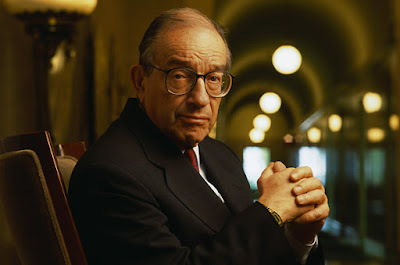 So, for this post, the focus will be on the effect of Greenspan over the years and, more importantly given the current climate, the effect that Economists can have in shaping the direction of society. Alan Greenspan’s thinking about financial regulation is simple, as demonstrated by the contents of the speech. In it he discussed how raising the capital requirements of banks i.e. the amount of money that they must hold in reserve, would potentially lower the rate of lending, but that the people who would not get to borrow would be ‘loans we shouldn’t be making in the first place’. He continued by stating that with higher capital reserves, the ‘contagious defaults like 2008 and 1929’ would be almost impossible and that defaults by banks should be borne by the shareholders, and not the taxpaying citizen. This is clearly a simplified understanding, and Greenspan continued the speech by explaining his theories with complex charts that he himself acknowledged were tough to follow; he proactively advised attendees to ‘go get a bite to eat if you aren’t into this kind of thing’ before explaining the complicated charts. This facet, although seemingly trivial, is perhaps the most important aspect of the news story, and in explaining Greenspan’s career and the following which he has cultivated, it should become clear why. Greenspan’s career is well documented, but there are certain points which are important for our understanding. Upon taking over the Chairmanship of the Fed in 1987 from Paul Volcker, on the request of President Reagan, Greenspan began a process which would see the so-called ‘Quiet Period’ (i.e. no serious economic crashes/systemic failures) brought to a tumultuous end, although this is debated by his supporters (or, formally, supporters of the notion of freer markets etc.). The decision to allow banks to establish affiliates that were able to deal in short-term commercial paper securities, a decision taken as soon as he had taken office, established a chain of events. Admittedly, the decision to open this source of business to commercial banks had restrictions, namely these products could not contribute more than 5% of the bank holding company’s revenues but, in 1997, the Fed increased this limitation to 25% - the 1990s, which included the Riegle-Neal Act of 1994 which increased competition between banks, and the generation-defining Gramm-Leach-Bliley Act of 1999, which effectively ‘eliminated the Glass-Steagall prohibition in banks engaging in proprietary trading and exempted investment bank holding companies from direct federal regulation’, can be rightly remembered as the era when large financial institutions we given the go-ahead to take extraordinary risks at the public’s expense and this era, in part, was designed by Alan Greenspan. The era was rounded off with the Commodity Futures Modernisation Act of 2000, which ‘barred federal regulation of swaps and the trillion-dollar swap markets, and which allowed U.S. banks, broker-dealers, and other institutions to develop, market, and trade these unregulated financial products’. Although Alan Greenspan was not the only person involved in this systemic destruction of societal protection – other infamous names includes Senator Gramm, Former U.S. Treasury Secretary Larry Summers, and Former U.S. Treasury Secretary Robert Rubin – Greenspan stands as the lynchpin for a number of reasons, but one in particular which relates to his speech this week. Alan Greenspan’s speech to the Economic Club was extremely important because of its timing. It was discussed in an earlier post in Financial Regulation Matters that President Trump is attempting to dismantle many parts of the Dodd-Frank Act, and such moves cannot happen with an intellectual foundation and it is for this reason that Greenspan’s speech seems calculated, rather than just coincidental. The Trump administration would be within its rights to focus upon the speech and the many supportive analyses that will undoubtedly follow, simply because it provides intellectual justification for their actions. Although Greenspan was renowned for his Chairmanship of the Fed, he is a revered Economist in his own right, and it is arguably this facet which has proven to be his most influential. Greenspan, along with a number of other economists, have championed the market in the face of the state, and when this is combined with being in the position to actually make changes, the effects are there for all of us to see. This viewpoint is shared by prominent Economists like Professor Calomiris who, quite forcefully, champions Greenspan as an innovator that should be revered: Calomiris often talks about Greenspan’s ‘skill as a beltway warrior, particularly with respect to his success in facilitating the geographical expansion of banks, broadening bank powers, and securing a prominent role for the Fed under the Gramm-Leach-Bliley Act of 1999’. Now, although the aim here is not to ‘throw stones’ and accuse people of complicity in the largest crash since the 1930s, this intellectual support for a regime that systematically shifted the balance of power to the wealthy elite and away from the public needs to be affirmed. Calomiris, as well as others, lay the blame for the Financial Crisis at the door of the Government, who they claim artificially inflated the mortgage bubble by way of its policies towards the Government-Sponsored Enterprises like Fannie Mae and Freddie Mac, which has some merit but is symptomatic of an issue within the Economic discipline. The Economic discipline, as a whole, has contributed in changing society beyond all recognition. Its importance to societal progression is symbiotic due to the centrality of the marketplace within modern society. However, what this means is that Economists, perhaps more than those in other disciplines, really must demonstrate levels of responsibility rarely seen in other intellectual fields – the reason is simple, their words can influence movements that will change the face of society for generations. For this reason, Greenspan’s speech this week should be seen for what it is – it stands as the justification for the deregulatory rhetoric that is emanating from the Trump administration. Whilst there are many economists who behave responsibly, and promote their ideas – even if based on free-market principles – in a considered and measured way, there is an elite within the field that do not. Furthermore, the use of overly-complicated communication, which stands to mask the implementation and effect to the ordinary citizen who it will inevitably effect, makes the actions of Greenspan over his career arguably reprehensible. Through his work and his actions, along with others, the stage was set for a systemic withdrawal of resources at the cost of society, and for that there can be no justification. A recent biography of Greenspan was entitled ‘The Man Who Knew’ and, arguably, there is no better title for a man who was central to setting the scene of the ‘too-big-to-fail’ phenomenon. Yet, a more abstract criticism of Economics, and this does not relate to every economist, is its ability to prescribe solutions from within a narrow ideological box. Economics must be understood for what it is – it is a discipline that seeks to study just one component of society; the dangerous-but-increasingly accepted view is that ‘what is good for the economy is good for society’, a viewpoint attributed to Freidman, and this could not be more wrong. Why? Well, the reason is simple, and demonstrates why a multi-disciplinary approach to determining societal-direction is required, rather than relying upon the economics discipline. It was reported in the Lancet that, from 2008 to 2010 alone, the Financial Crisis may have caused an additional 500,000 deaths from cancer, based upon the lack of access to health, and the increase in stress more generally. Furthermore, a recent study suggests that, by the end of 2015, the U.K. alone had experienced the ‘largest annual spike in mortality rates for nearly 50 years’, with an additional 39,074 deaths across England and Wales representing a 7.4% increase from 2014-15 – the report deducts that the sharp increase can be linked to austerity measures, which stem from the systematic extraction of wealth in the lead up to the Financial Crisis. The Economics discipline is a noble discipline, but its increased centrality to policy-making has made it a prime candidate to be hijacked by those who have little regard for societal welfare. What is needed after such a monumental crisis is a multi-disciplinarian approach, like that implemented in the ‘New-Deal’ regulations after the Great Depression, so that a number of perspectives can play a part in shaping how society moves forward and, hopefully, usher in a new Quiet-Period. Yet, there is no sign of this, and with the rhetoric from both Washington and London being focused on economic wellbeing, rather than social wellbeing, there is little prospect of the dynamic that brought about the Financial Crisis changing anytime soon. HBOS Fraud Trial: Effective Deterrent?